Am I allowed to throwback to a Perfect Strangers reference? Now we are so happy, we do the dance of joy! Paddlers, we have a paddle launch. It’s been a long time coming, but BREC’s paddle launch at Highland Road Park is here! 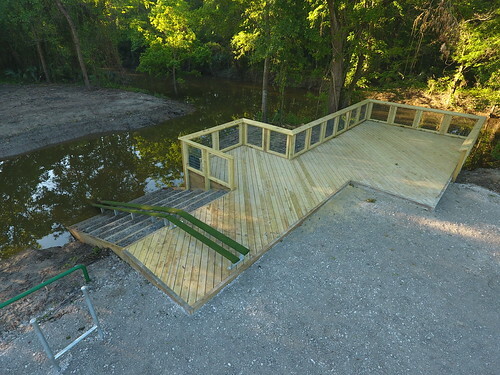 The construction equipment and fencing is gone, and where it was, we now have a fantastic paddle launch. Already, we’ve personally met several people who have just paddled Bayou Fountain for their very first time, and this is just the first weekend. Woo-hoo! So, some bits of useful information for your reference (to be updated on our maps and descriptions soon). In this next photo, taken Sunday, the water level is on the high end of medium. You can see seven dry steps going down from deck level. There are a total of 13 steps, with the bottom two extra long and sticking out to the left. If the water is below all 13 steps (including the two long ones), you may hit a few extra submerged logs. You certainly wouldn’t want to try to paddle a paddleboard with a skeg sticking down when the water’s that low. Upstream on Bayou Fountain (to the right leaving the launch) is only shaded until you reach Siegen/Burbank (about 1/4 mile). 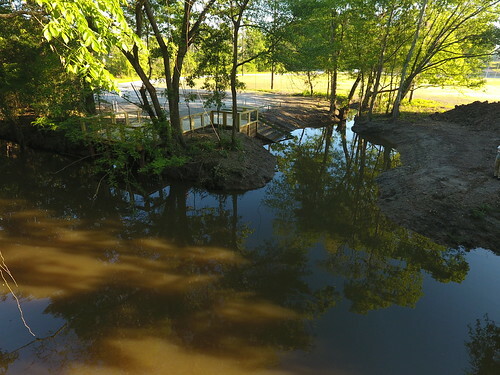 The wonderfully shaded and serene section of Bayou Fountain is downstream (to the left), with Rackley Bridge about half a mile downstream. When the water is low, you can stand up, reach up, and barely touch the bridge, but when the water is high, you may have to go around it on the right (south) bank. 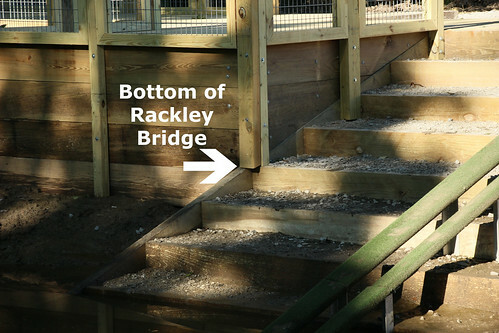 Conveniently, the bottom of Rackley Bridge is the same as the bottom edge of the corner deck post where it hits the slope of the stair beam, so look at that to know whether you’ll be able to stand, sit, duck, or portage if you’re heading downstream. As the water goes up and down, there’s likely to be a bit of mud around. Fortunately, a stair-style launch like this is perfectly usable even when covered in mud. Your shoes may get a bit dirty, but you shouldn’t have to worry about the Louisiana slip-and-slide of a bank entry. Just don’t step off the 13th step onto… or should I say into… the bottom when the water’s low. Well, there you go. 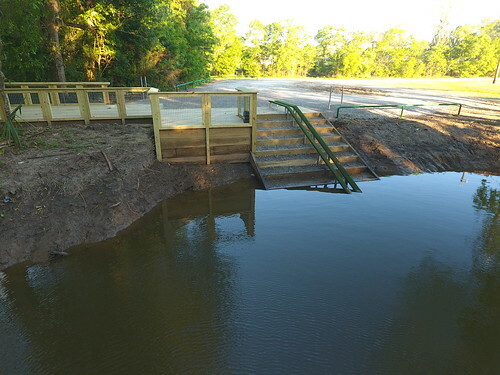 A quick teaser and some useful information about the new paddle launch at Highland Road Park. 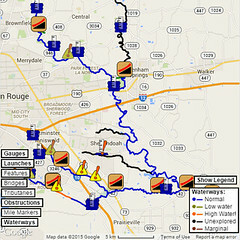 We’ve been working toward this for quite a while, PaddleBR on the bayou and BREC on getting the launch built. Now we all get to enjoy the fruits of everyone’s hard work. We can’t wait to see you out there! Amazingggggg! Thanks for all your work to get projects like this completed!